I'm back again with another stash busting post, this time I have three different flavors of Brownie Brittle, and they're all Organic! 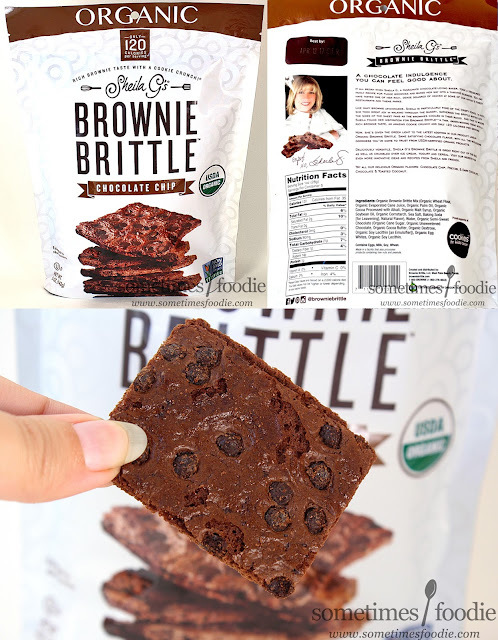 Will being organic make it less addicting and flavorful than normal Brownie Brittle? Can healthier junkfood still taste good? Time to find out! The packaging for all three bags in the same, so there's not much ground for me to cover there, so I'm going to focus on taste for this trio of crispy crunchy brownie goodness. Smell: Just like a Mounds bar! The perfect blend of coconut and chocolate. It also makes me think of Samoa Girl Scout cookies! Taste: So incredibly good! I love coconut, and mounds bars, and so this was right up my alley. You get all the chocolatey goodness of classic Brownie Brittle with little morsels of chocolate and a healthy dose of toasted coconut. The coconut may get stuck in your teeth, but it tastes so good that I don't mind. I also found that this flavor was significantly sweeter than the other two. If you like Samoa cookies, or Mounds bars, this is the brittle for you! Easily my favorite of the three, and I think it'd make the best ice cream topping or milkshake mix-in! Smell: Just like chocolate breakfast cereals and baked goods. It's a light aroma, with a dry and slightly bitter cocoa-powder finish. Classic and enjoyable. Smell: Chocolatey with a hint of salty pretzel and...malt? Something about the scent of this one reminds me of a chocolate malted milkshake and pretzel rods. Not a bad combo at all. Taste: You get a lovely, light, chocolate flavoring (similar to chocolate Pizzelles) with a more substantial crunch due to the added pretzel pieces. The pretzels aren't as salty as I would have liked, but they do make the flavoring more complex and I love the added texture. I did find this flavor to be drier than the others, and I found myself craving a glass of milk after a few pieces. Not bad at all, but if there had been more salt, I think this flavor would have really shined. 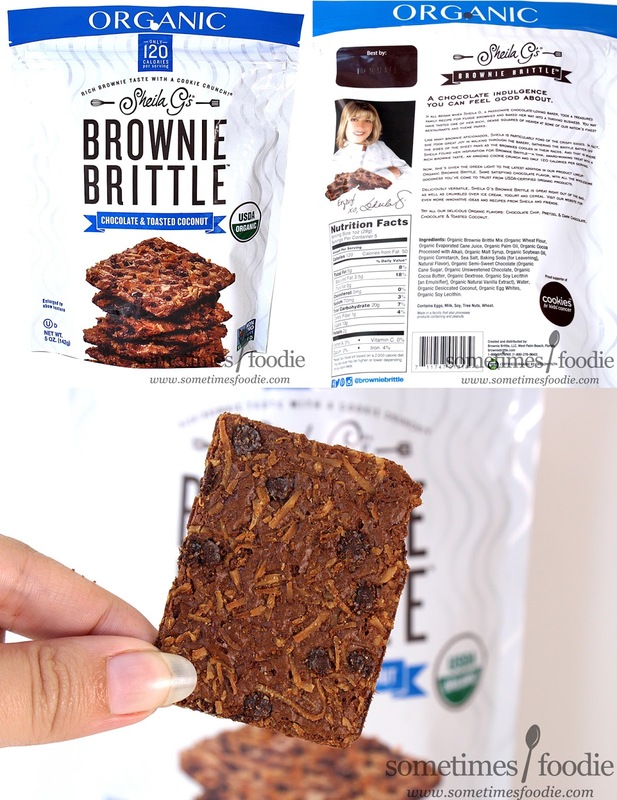 I might not buy this one again, because it left my mouth a little dry compared to the others, but I really like the idea of a sweet and salty Brownie Brittle. I hope they explore with some more adventurous flavors down the line, like a sweet and spicy Mexican Hot Cocoa version. Or at the very least, a saltier version of this Pretzel one. 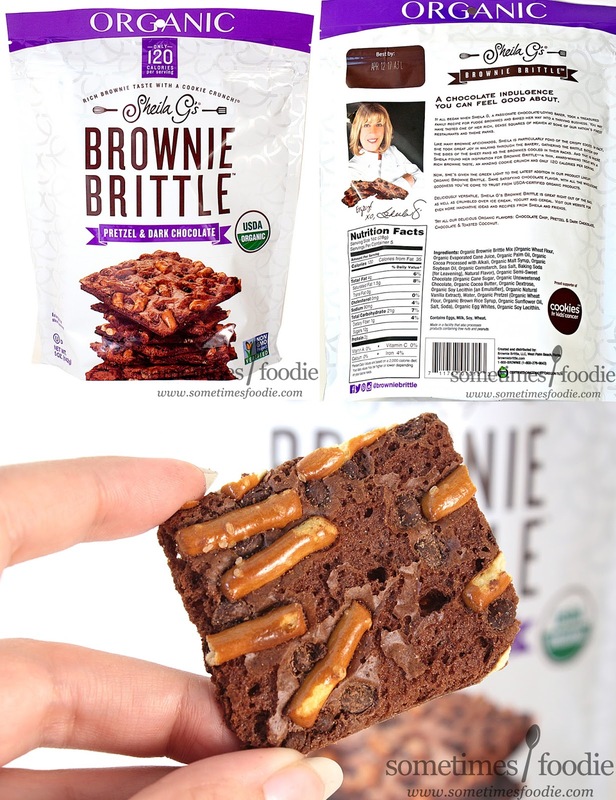 In Conclusion: I don't think it's possible to make a bad flavor of Brownie Brittle. It's thin, crispy, chip-like brownies! How could that ever go wrong? Going organic did make these flavors taste less sweet than normal Brittle, but I still enjoyed it all the same. For me, this being less sweet makes it more recipe and mix-in friendly. I'll have no trouble polishing off all three bags. Plus, If I share them with my family this weekend, I doubt they'll live to see Monday morning. Since they're organic I can also trick myself into thinking they're health food, but when I'm using them to top an ice cream sundae or make s'mores...that might be a bit of a stretch. Like Sometimes Foodie's Facebook to keep up with my daily adventures! You could make ice cream sandwiches out of these and then roll the sandwiches in the crumbs! !